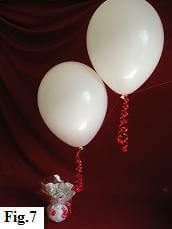 Position your first balloon on the nylon line about 10 to 15cm above the base. 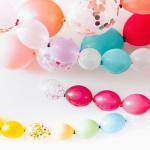 If you wet the nylon line with your fingers, you'll find the balloon slides along very easily. 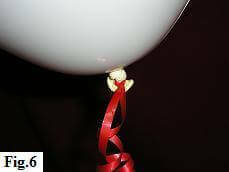 Take about 1m of your curling ribbon and tie it to the neck of the balloon, so that you are left with two equal lengths hanging from it (fig. 6). Now curl the ribbons, using the open blades of your scissors. 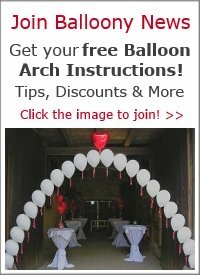 We recommend doing this for each balloon as you go along, but you may prefer to wait until all the balloons are attached. Inflate and attach your second balloon as explained in Step Two (opens new window). Then position it so that it's just touching the first balloon (fig. 7). 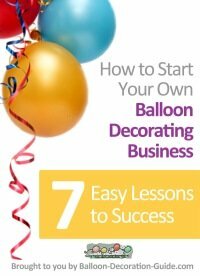 Repeat Steps Two and Three for all your remaining balloons. Your 'String of Pearls' is almost finished. All you need to do now is to cut the nylon line from the roll, leaving about a meter to play with and attach it to the second base with a temporary knot. 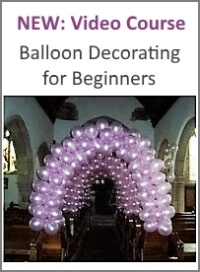 With your decoration in its final position, stand back and check that you're happy with the height and the spacing of the balloons. Make any adjustments, if necessary, and then finally tie your securing knots on the base. Congratulations! You've created a beautiful 'String of Pearls', that's sure to impress your guests. There are many ways to add extra touches. 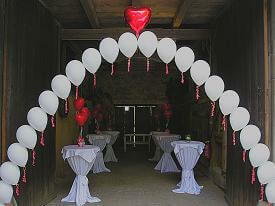 In our example we crowned the archway with a red mylar heart to tie in with the theme of this decoration.